Speakers – Clearly you love music and are interested in hi-fi sound quality; otherwise you wouldn’t be reading this blog. So I’m going to let you into a hi-fi secret; if there’s one thing that really upsets everyone that works at Q Acoustics, (and other loudspeaker companies) it’s the knowledge that so many of the people who own our hi-fi speakers don’t actually know how good those products really are. Why? Well it’s not because they’re using inadequate amplifiers or listening to poor quality recordings. It’s simply because the position and set-up of their speakers is not optimised for their listening room. Optimising the position and set-up of your speakers will make a big difference to the enjoyment you’ll get from an audio system. Correct positioning and set-up means you’ll hear the best and most detailed bass response, dynamics, mid-range clarity and three dimensional soundstage which your speakers can deliver from your system. Chances are that will be a noticeable improvement on the sound you’re currently hearing – and this ‘upgrade’ will be free. Let’s start with speaker height. Nearly all hi-fi and home cinema loudspeakers contain more than one speaker drive unit; a small ‘tweeter’ which delivers the high frequency sound and one (or more) larger drivers which produce the mid-range and bass sounds. Generally, the ideal height to experience the best sound will be to position your speaker’s tweeter at approximately the same height as your ears – when you are in your normal listening position. For most people, this will be when they are sitting in their favourite armchair. Why is this important? It’s about those Sabre Tooth Tigers! High frequency sounds are very directional and tend to be emitted from most tweeters in a relatively tight ‘beam’ of sound. To make matters ‘worse’, our ears are also very sensitive to the direction of those high frequencies. The anecdote most often referred to in hi-fi circles, is this is the direct result of evolution. The guys with the best directional hearing could identify the sound of cracking twigs when a sabretooth tiger was creeping up behind them. You never know, it may be true! With floorstanding models, tweeter height is likely to be correct already. With small speakers this will mean positioning them on appropriate height shelves, furniture or dedicated speaker stands. There is a bit of a dilemma here. For stereo music reproduction the ideal position is usually to place the speakers so that they form two corners of an equilateral triangle, the third corner being you the listener. 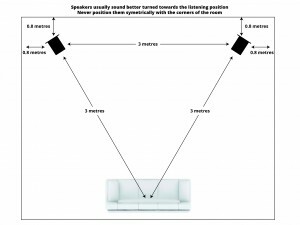 This means for example; if the speakers are 3m apart from each other, they will also be 3m from your listening position. The dilemma is: that may not be the optimum position for home cinema sound (but it could be). 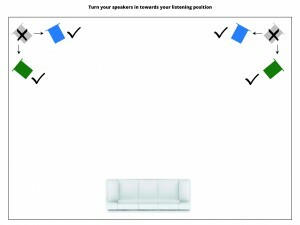 In order to ‘tie the sound to the screen’ for home cinema effects, it is recommended the front left and right speakers are placed no more than ‘twice the width of the screen’ away from each other. Using the same example, the front speakers should be 3m apart only if screen is 1.5m wide. When you’re listening to your speakers, you don’t just hear the sound coming direct from the speakers themselves, you also hear sound reflected off everything else in the room. Mostly this is not a problem, but if your speakers are placed close (less than 50cm) from a rear wall, then the radiated sound will reflect from that wall and artificially increase the level of bass and, to a lesser degree, mid-range sounds. The result is usually a ‘boomy’ and muddled bass – which is of course undesirable. It’s also normally best to ‘toe-in’ the speakers – which means turning your speakers to face your listening position. Rigidity – Stop Your Speakers Wobbling! Lastly, to get the best results, it’s important to prevent your speakers ‘wobbling’. As you know, the sound you hear is created by the movement of the speaker cones. You can easily see the cones move when you hear loud deep bass sounds. When your speaker plays high frequency sounds, the movements are microscopic and too small to see. Knowing this, it’s obvious that if your speaker is not held rigidly in position (that is; it can rock/wobble when gently pushed). Then some of the movement of the cones will be cancelled out by the whole speaker rocking back and forth. This degrades the quality of sound you hear. 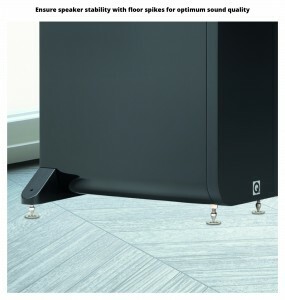 Good speakers and speaker stands often have adjustable ‘floor spikes’ to overcome this problem. Spending a few minutes adjusting these spikes to make sure they properly contact your floor, so your speakers can’t wobble, will deliver a further distinct improvement to soundstage and dynamics. If you, understandably, wish to protect wooden or tiled floors from spike damage, simply place a small metal disc under each spike. (Small denomination coins are the perfect solution). I’ve talked about the sound emitted from your speakers being reflected off walls, and the desirability of reducing this where possible. The other reflective surface that often degrades a speaker’s perceived performance is the shelf or furniture on which small speakers and soundbars stand. 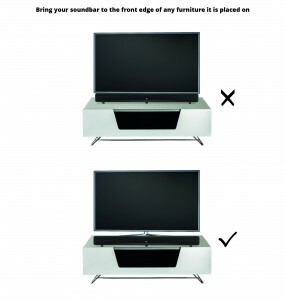 If you have small speakers or a soundbar, bring them to the front edge of the furniture/shelf they are sited on. This will eliminate these reflections and again result in a cleaner, more open and detailed sound. Sadly, this is true for so many of us. So what’s the most important advice? Firstly, try not to get speakers that are too big for your room. You’ll end up with boomy, uncontrolled bass notes, which will be near impossible to correct. Secondly, if you possibly can, keep your speakers out of the corners and certainly not symmetrical with a corner. In summary, a little time siting your speakers in an equilateral triangle with your listening position – but keeping them out of the corners and ensuring they are ‘rigid’, will deliver clear improvements to your music experience.